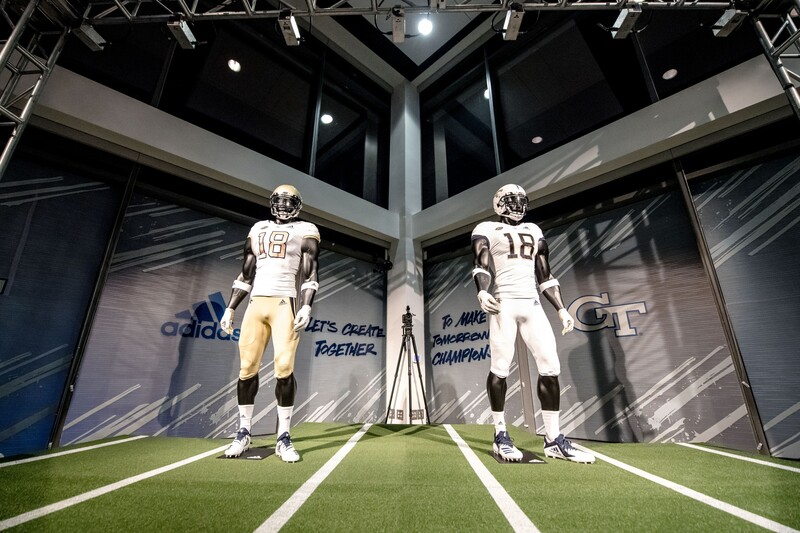 In July, Georgia Tech officially began a new partnership with Adidas, dropping longtime brand Russell Athletic. Friday, the football team released its new jerseys. And they look clean. The team only released two jerseys Friday, and strangely, both are white. The first, with gold numerals outlined in navy blue, will serve as the home jersey. It was paired with gold pants and a gold helmet for the uniform reveal. The second jersey featured navy blue numerals and stripes, and was matched with white pants and a white lid. It was referred to as the Whiteout jersey, but will also serve as the team’s road uniform. Two small details on the new kits pay homage to the team’s mascot, the Yellow Jacket. The stripes on the jersey’s sleeves and collars, and the main stripe on the white helmet are all modeled after a stinger from the animal, while the “swarm pattern” inside the numbers evokes the pattern found on a yellow jacket’s body. According to the Atlanta Journal-Constitution, a third alternate jersey is in the works, which may debut later in the season, or in 2019. Georgia Tech will debut the uniforms on Sept. 1, when they host Alcorn State to start the 2018 season.